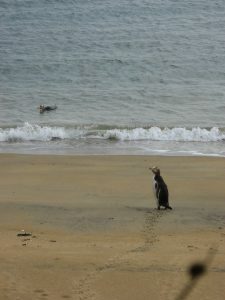 The degree to which human disturbance is an issue tends to be site specific, some penguin breeding sites have no public access and others have a constant stream of visitors. There are various types of disturbance, from extreme direct impacts (e.g. a dirt bike squashing a penguin nest) to the more common indirect impacts (e.g. noise and visual disturbance from people at breeding sites). Seemingly harmless acts such as standing on the beach, can actually prevent a penguin from accessing the nest and feeding its chicks. A number of studies examining the impacts of tourism (particularly unregulated tourism) on hoiho show that disturbance increases stress, and reduces breeding success, fledgling weight and the probability of survival.